Collagen is a protein that exists naturally in the skin. As we age, the amount of collagen in our skin declines. The loss of collagen is one reason why wrinkles develop. Most injectable collagen comes from cows. It's processed and purified to be safe for use in humans. Collagen from human sources is available and it's also possible to have injectable collagen made from your own tissue if you're having plastic surgery, such as a mini face lift. Doctors are working to invent a synthetic collagen which can be made in a laboratory. Collagen is a less appropriate choice for certain problems. For example, vertical lines around the lips might be helped more by other wrinkle treatments, such as resurfacing with dermabrasion or laser therapy. To see if a scar might be helped by collagen injections, try this simple test. Gently place your fingers to either side of the scar, and apply tension by pressing down and away from the scar. If it smooths out, collagen can probably help. If not, the scar tissue may extend too deep in the skin for collagen to make a difference. Collagen injections aren't permanent. Since collagen is a natural skin molecule, it's absorbed into the body over time. The effects of an injection last from a few weeks to several months, depending on the person and the injection site. A few people find that the results last much longer. The injection process is simple and quick. Collagen is usually mixed with lidocaine to numb the skin, so no separate anesthetic shots are needed. 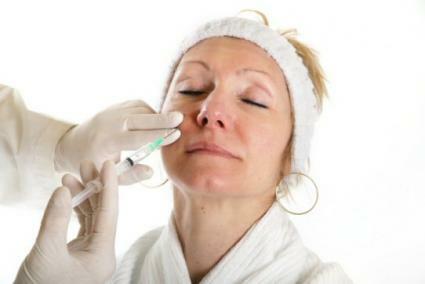 Using a tiny needle, the doctor will inject small amounts of collagen at several places along the area being treated. Different collagen mixtures are used for different types of wrinkles and scars. With shallow scars and fine wrinkles, the doctor may need to "overfill" the wrinkle or scar, leaving the skin's surface looking raised. This is because the collagen mixtures that are used contain saline to make them thinner. After a few days, the saline is absorbed into the skin and the surface should look smooth. Deeper scars and wrinkles may require a thicker collagen placed deeper in the skin. In these cases, overfilling is not necessary. Recovery should be quick. Some patients have redness at the injection site which takes a day or so to go away. Occasionally there is redness or bruising that lasts several days. Allergic reaction. The doctor should do a skin test about a month before the injection to minimize the risk of serious reactions. Infection. Although it's not common with these injections, infection is a possibility any time the skin is broken. Scarring. If skin reacts badly to the injection, damage and scarring can result. Lumpy appearance. A skilled doctor should be able to give the skin a natural appearance. If too much collagen is injected, or if it's placed improperly, skin may appear lumpy. New fillers are constantly being developed. Check with your dermatologist to find out what's new.